If you were to poll a large group of people as to what their favorite fall flavor is you would likely receive one of two answers…pumpkin or apple. Apples not only have a sense of warmth and comfort that equates to fall but they are also in abundance this time of year. Personally, I love both flavors and if polled I would not be able to choose a favorite. Although I could never choose one over the other I will admit that I have been indulging my love of pumpkin more as of late. Almost every day I have been enjoying a pumpkin spice latte with breakfast so when I saw apples on sale at the market it was time to take a pumpkin break. Typically when I think of apples I lean towards my go-to pie and cobbler recipes but this time I sought something different. 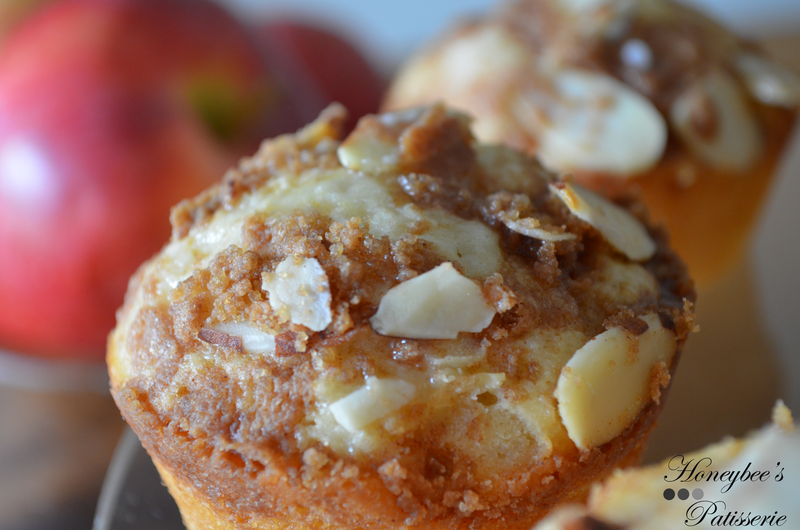 Being as busy as I am, muffins are a quick and simple way to snack on the go. 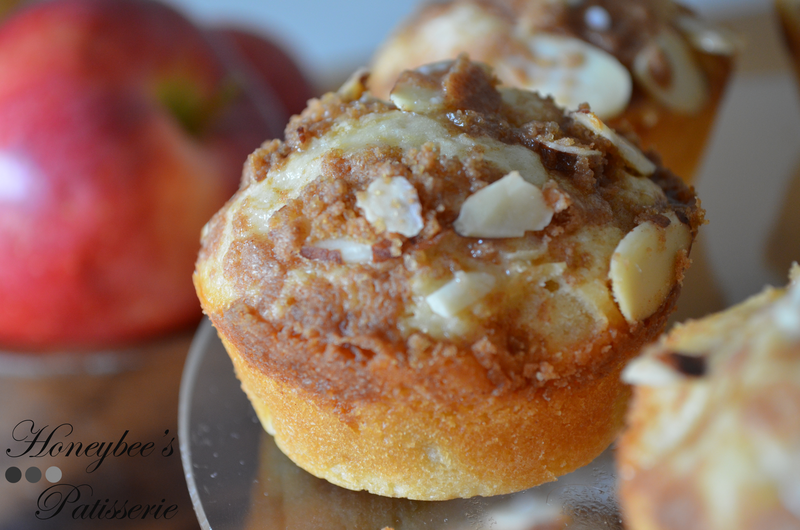 Keeping that in mind I decided to develop a skinnier version of a typical apple muffin. Just as I had imagined, these muffins are to die for. 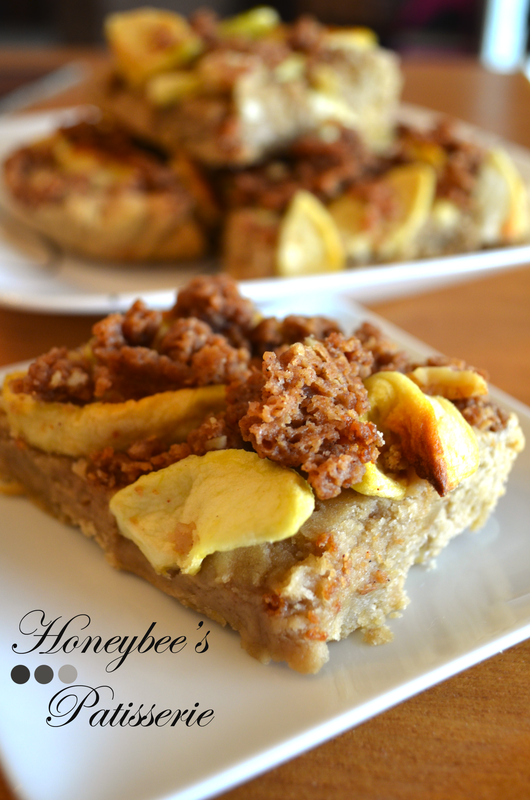 Biting into one is like eating a coffee cake hinted with nutty almond and laced with surprise chunks of sweet apple. Although I have named these muffins they are technically cupcakes. The process in which the batter is prepared is the creaming method used for cakes (butter/sugar creamed, eggs/extracts added, followed by the dry and wet ingredients being added alternately, beginning and finishing with the dry ingredients) versus the traditional muffin method. Even though by definition these are cupcakes, the texture is somewhere between a cake and a muffin. They are not quite as light and airy as a cake but they are certainly no where near as dense as a muffin. Outside of texture they assimilate more with muffins than cupcakes. I ultimately deemed them muffins because they are riddled with fruit, have a streusel topping, and lack a thick coating of sweet frosting (outside of the thin drizzle of glaze) like that of muffins. After preparing these muffins I think the only thing I would change about them is the yield size. I would certainly double the recipe next time so that I have 24 instead of only 12 because they disappeared way to fast for all the labor involved. The actual preparation of the batter, streusel, and glaze is not all that laborious but the tall stack of dirty bowls and utensils the recipe leaves behind sure is. Despite the fact that these muffins are designed to be a skinnier option compared to other muffin recipes, you will likely be tempted to eat more than one, which kind of defeats the purpose. If you want to shave a few more calories you could certainly leave off the glaze and the muffins would still taste fine. I don’t recommend it since there is very little glaze that is actually drizzled on each muffin serving to make that much of a reduction but the difference in taste is noticeable. Just a tiny bit of glaze manages to round out all the flavors perfectly. 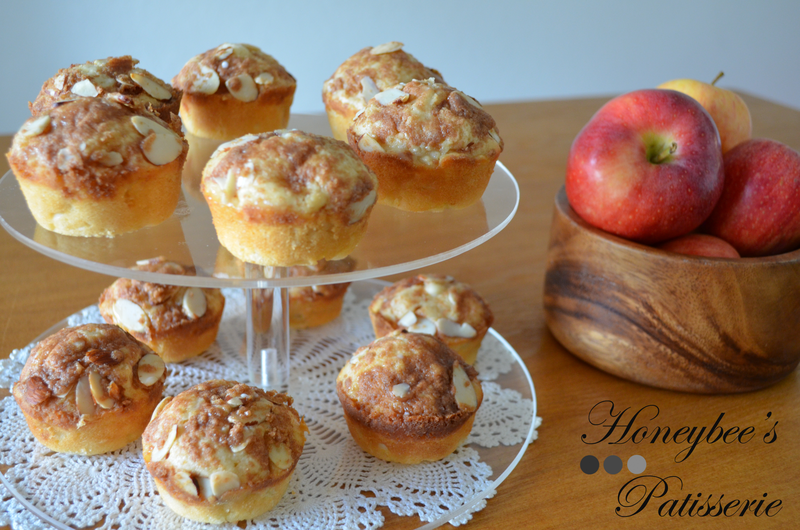 Like many of my recent posts, these muffins can be enjoyed as a dessert or at breakfast with coffee or tea. This recipe will produce 12 servings with one muffin being equal to one serving. If you are following Weight Watchers, one muffin is 6 Points or 7 Points Plus. Preheat oven to 350°. Spray a 12-cup muffin tin with nonstick cooking spray and set aside. In a medium size bowl combine 6.75 ounces flour, baking powder, salt, and baking soda. Stir with a whisk until just incorporated. In the bowl of a stand mixer (or a large bowl) combine the granulated sugar, cream cheese, and ¼ cup butter. Beat the mixture on high-speed until well blended. Add the almond extract, vanilla, and egg and beat with the mixer on medium speed until just combined. In a small bowl, whisk the yogurt and ¼ cup milk together until incorporated. In another small bowl, toss the apple with 1 tbsp. flour until apple pieces are evenly covered. With the mixer on low-speed, add the flour mixture and yogurt mixture by alternating until combined. Begin by adding 1/3 of the flour mixture to the sugar mixture and beat until just combined. Add half of the yogurt mixture and beat until just combined. Repeat the process of adding the flour mixture and then the remaining yogurt mixture, being sure to end with the last 1/3 of the flour mixture. Gently fold the apples into the batter. Evenly divide the batter among the prepared muffin cups. In a small bowl, combine 2 tbsp. flour, brown sugar, and cinnamon. Using a pastry blender (or fork or 2 knives), cut in the 2 tbsp. of chilled butter until the mixture resembles coarse meal. Stir in the almonds. 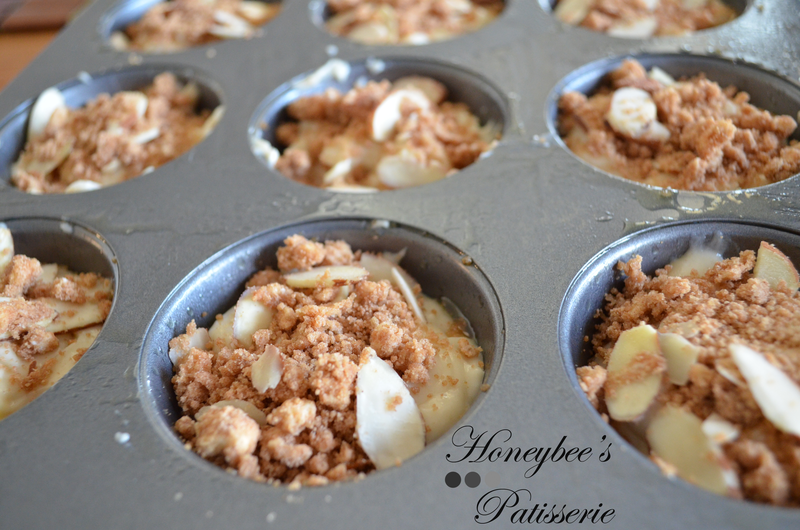 Sprinkle the streusel evenly over the batter in the muffin tin. Bake the muffins for approximately 20-25 minutes, or until a toothpick inserted in the center of the tallest muffin comes out almost clean. Cool the muffins in the pan for 15 minutes on a wire cooling rack. After 15 minutes remove the muffins from the tin to cool completely. While the muffins are cooling prepare the glaze. In a small bowl combine the confectioners’ sugar, milk, and almond extract. Stir with a whisk until smooth. Drizzle the glaze over each cooled muffin and serve. Whenever the days turn cooler everyone in the house begins craving warm drinks, rich spices, and anything apple. Today was one of those days where it was cool but not freezing, reminding us of a brisk fall day more than chilly winter. Unfortunately, I did not have any apples on hand to make a pie but I did have some dried apples. Dried apples are perfect for apple bars because they do not make the bar too soggy like a fresh apple would. Problem is I love the flavor fresh apples bring to any baked good. To amp up the flavor of the dried apples I turned to a favorite of mine that I always use in my apple turnovers, apple butter. I had some apple butter I had made in the fall from fresh apples still in the refrigerator so I paired that with the dried apples to rehydrate them with the flavors of their fresh counterpart. 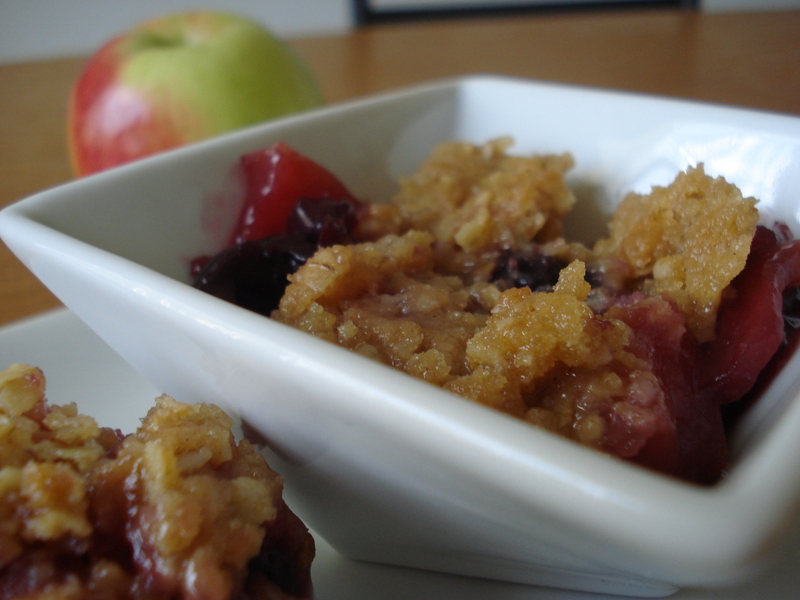 I love apple cobbler but it is something you need to sit down and eat from a bowl. 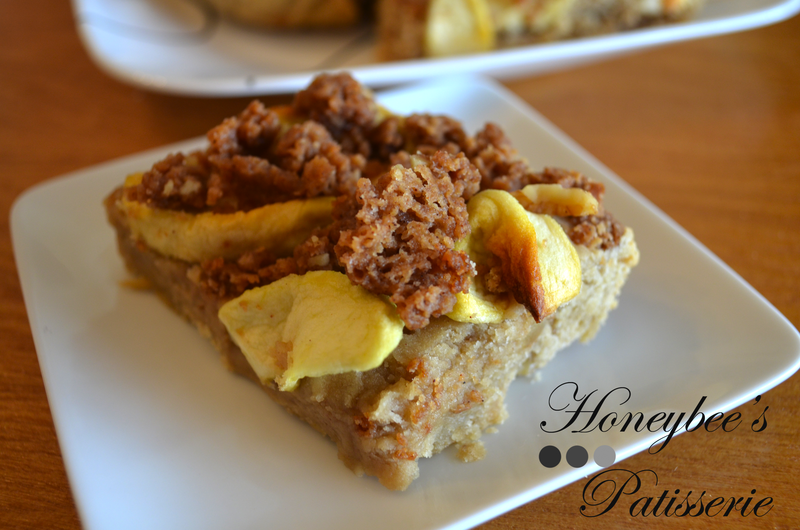 I love these bars because it makes apple cobbler portable for our always on the go family. The following recipe yields approximately 24 bars. You can use homemade fresh breadcrumbs or plain store bought breadcrumbs without any noticeable difference. Also make sure you toast the walnuts before you add them into the bars. The toasting helps bring out the nutty flavor and enrich the bars overall. Heat oven to 350°. Line a 13×9 inch pan with foil. Be sure to allow excess foil to hang over the sides of the pan to allow an easier lift. Grease the pan with nonstick cooking spray and set aside. To prepare topping: In a food processor pulse bread crumbs, walnuts, sugar, flour, butter, and cinnamon until coarsely ground. To prepare bar base: In a large bowl combine the flour and baking powder. With a stand mixer or electric hand mixer, beat the butter and sugar on medium-high speed until light and fluffy. Add eggs, apple butter, and vanilla, mixing until incorporated. Reduce speed to low and add the flour mixture. Continue to mix until just combined. Stir in the chopped walnuts by hand. Press the dough into the prepared pan. Scatter the apple slices over the dough. Sprinkle with the crumb topping and bake until the bars are deep golden brown, about 20 to 25 minutes. Cool the bars completely on a wire rack, at least one hour. Once cooled, use the excess foil to lift the bars out of the pan. Cut the bars into squares and serve. Bars can be stored at room temperature in a sealed container for about 3 days. 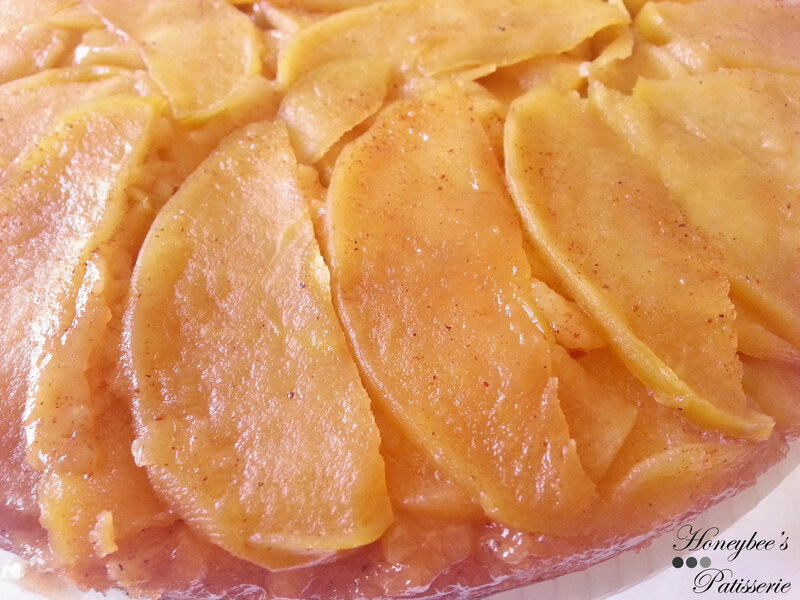 Before the pineapple took center stage, every upside-down cake featured the apple. Nowadays you can’t research upside-down cake recipes without finding a slew of pineapple results. 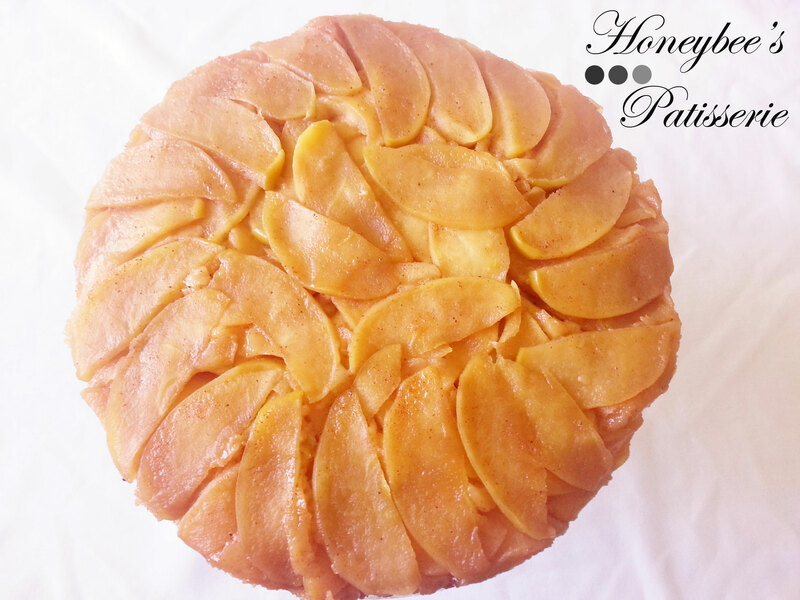 Without any hint of dying love for the pineapple variation, it is no wonder the traditional apple upside-down cake has become a lost recipe. This intrigued me as all lost recipes do and I set out to reignite the spark in the modern generation that the traditional had generations ago. So I can’t solve the apple prep issues but the discoloration is easy to fix with a few drops of lemon juice. To kill two birds with one stone, precooking some of the apples in a skillet before placing them in the bottom of the pan helps speed up the cooking time so that the apples and cake cook evenly but also solves the hidden liquid issue by allowing the excess to excrete during heating. Besides solving problems, cooking the apples in the skillet presents some perks. While cooking, the apples become caramelized in their own juices with the help of a little bit of sugar. 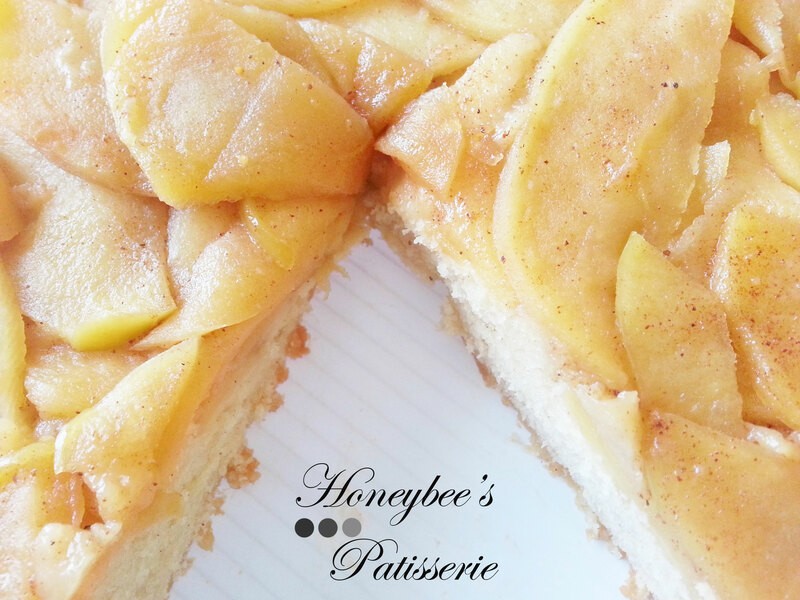 This not only infuses the apples with delicious flavor, but also makes the top of the cake a showstopper. With the apples in check, the cake must also be up to par. This means creating a cake that is able to stand up to the pressure of such beautiful apples weighing heavily down on it. The easiest way to make sure the cake wouldn’t buckle under such immense pressure (stupid diva apples) is to use the quick bread method which introduces less oxygen into the cake batter, allowing for a sturdier crumb. With all the science figured out, and a little additional touches of flavor, the apple upside-down cake was ready for its debut. 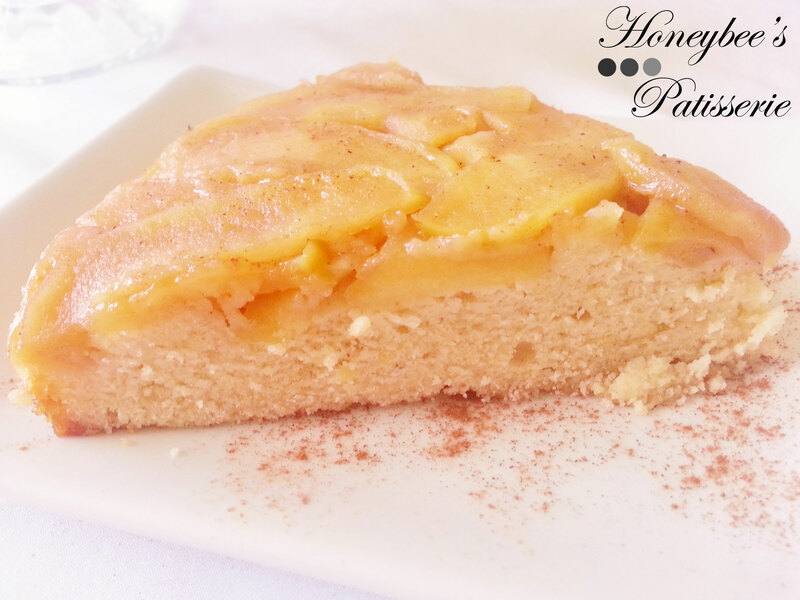 Although I will always have a special place in my heart for pineapple upside-down cake (the first recipe my grandfather ever showed me how to bake) I can’t deny how awesome this cake is. My boyfriend is not a sweets person and needless to say he needed no help in finishing this cake off. 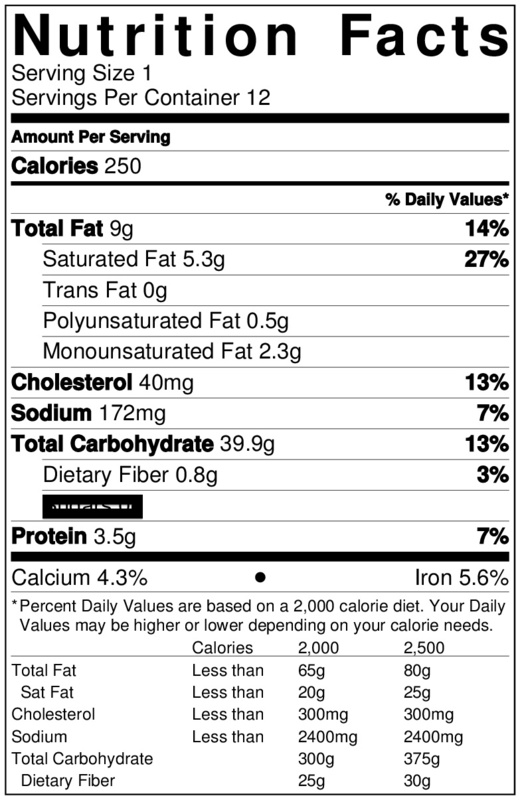 Note: This cake serves 8… unless you have an individual who adores apples…in that case it may be 2 servings!!! For the topping: Butter the bottom and sides of a 9 inch round, 2 inch deep nonstick cake pan. Adjust oven rack to the lowest position and preheat oven to 350°. Slice two of the apples into ¼ inch thick slices; set aside. Cut the remaining 2 apples into ½ inch thick slices. Heat 4 tbsp. butter in a 12 inch skillet over medium-high heat. When the butter has melted completely and the foaming has subsided, add the ½ inch thick slices of apple and cook, stirring occasionally, until the apples begin to caramelize, about 5 minutes. Be sure you do not fully cook the apples!!! 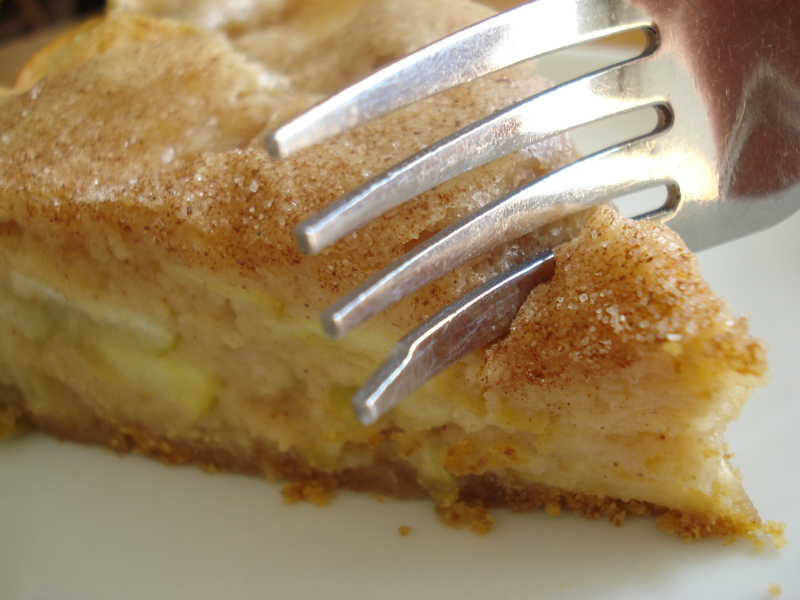 Add the ¼ inch thick apple slices, 2/3 cup brown sugar, lemon juice, and ½ tsp. Apple Pie Spice. Continue to cook apples, stirring constantly, until the sugar dissolves and the apples are coated, about 1 minute more. 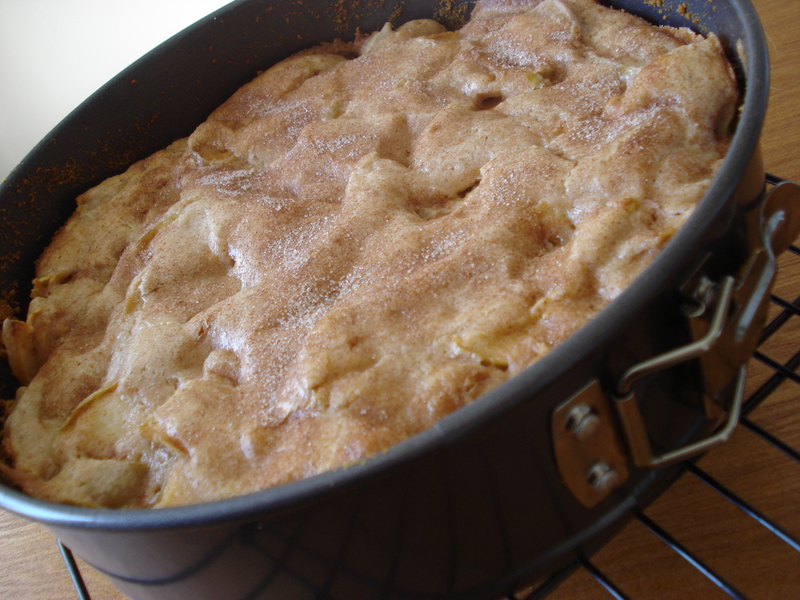 Transfer the apple mixture to the prepared cake pan. If desired, arrange apples into a design and press gently into an even layer. Set aside to prepare the cake. For the cake: Mix the flour, cornmeal, baking powder, salt, & remaining ½ tsp. of Apple Pie Spice in a medium bowl; set aside. Whisk the granulated sugar, ¼ brown sugar, and eggs together in a large bowl until thick and thoroughly mixed. Slowly whisk in the 6 tbsp. of butter until combined. Add the sour cream and vanilla; whisk until combined. Add the flour mixture and whisk until just combined. Pour batter into the pan and spread evenly over the apples. Bake the cake until it is golden brown and a toothpick inserted in the center comes out with a few crumbs attached, 35 to 40 minutes. Cool the pan on a wire rack for 20 minutes. Run a knife around the sides of the cake to loosen it. Place a wire rack over the cake pan. Hold the rack firmly and invert the cake and wire rack together; lift off the cake pan gently. Place the wire rack over a baking sheet to catch any drips. 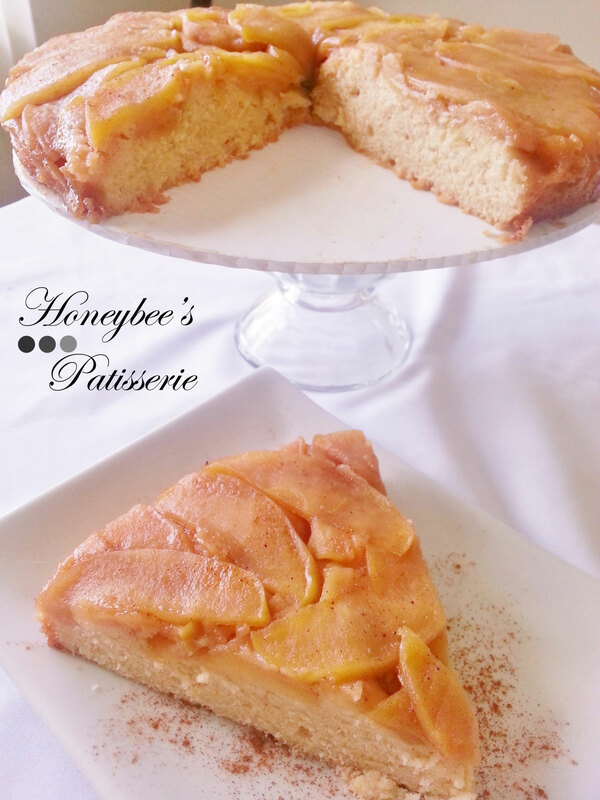 Allow the cake to cool another 20 minutes and then transfer to a serving platter, cut into pieces and serve. 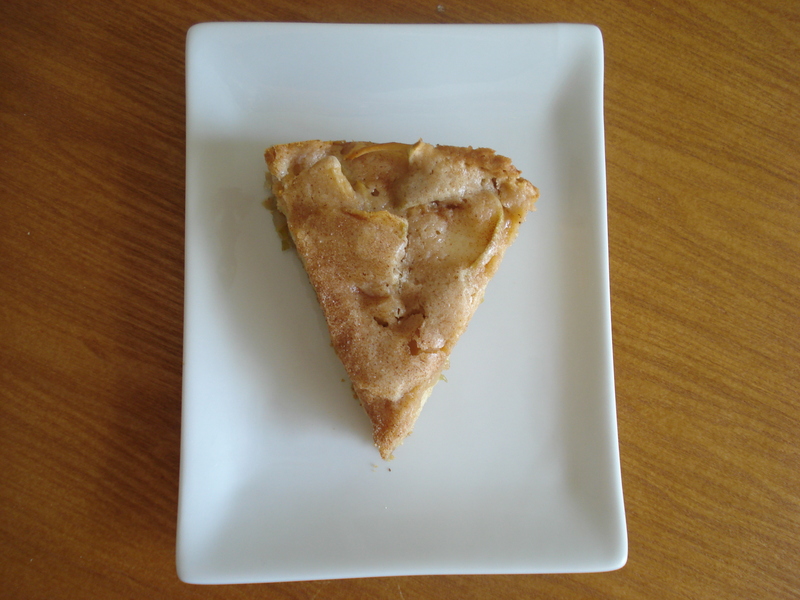 It has been awhile since my last post so I thought I better catch up and what better way than to do so with an old American favorite… Homemade Apple Pie. The twist here is though that I did not prepare this particular homemade apple pie the conventional American way. I cheated on America and made it the Swedish way. I have to give credit where it is due to the Swedes…this is a mighty fine tasting Apple Pie and the ease of it makes it that much more delicious. What would you say if I told you that this pie could be made on a work day or school night without you pulling all of your hair out doing so. Crazy right…well wrong because this pie is capable of just that. It is simple and delicious and a pleasant twist to the original we all know and love that it can even be served at a dinner party and you will be sure never to go wrong. A drizzle of Vanilla Bean Creme Anglaise or if you want a more traditional paring like what my grandfather preferred… a big heaping scoop of Vanilla Ice cream. This pie is sensational. 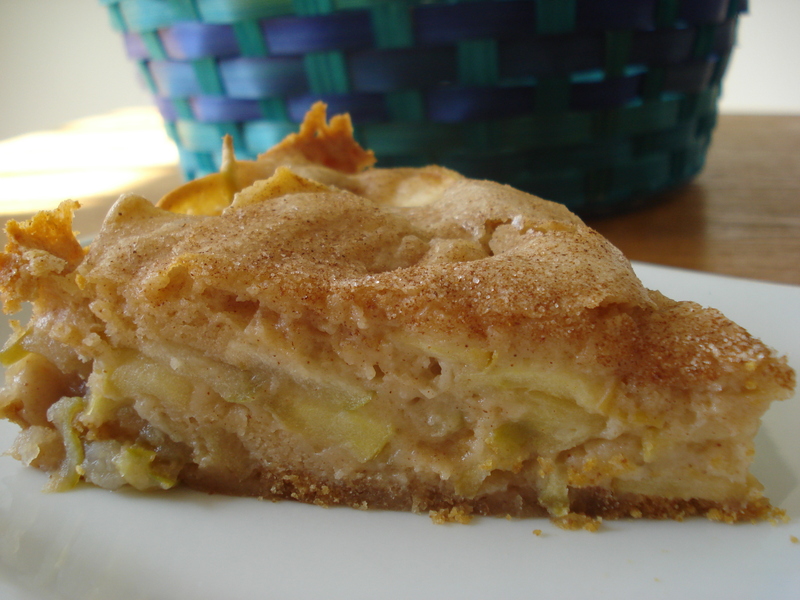 It is a cross between a spiced apple cake and a dense pie with a crisp sugar coated apple topping and a crisp and buttery thin crust. A few notes before I send you off to baking this delicious creation. 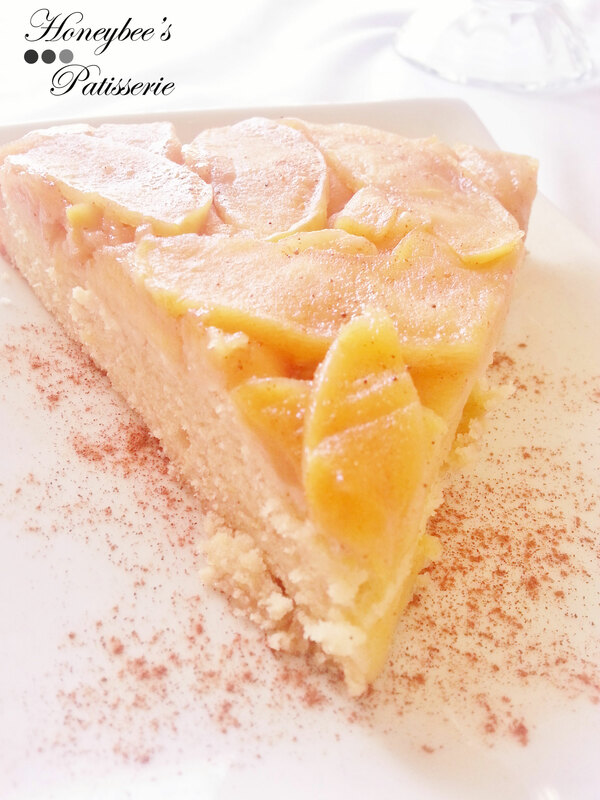 Be sure to use two different varieties of apples here, one that is tart and one that is more sweet. I chose to use the ratio of 3 Granny Smith’s to 2 Braeburn, however you can use Golden Delicious or Gala apples in the place of Braeburn but be sure to use Granny Smith’s for tartness no matter which type of sweet apple you choose. Adjust oven rack to middle position and heat to 325°. Grease bottom and sides of 9-in. spring-form pan with 1 tbsp. butter. Melt remaining softened butter in large nonstick pan over medium heat. Add graham crackers and toast until golden brown. Transfer crumbs to bowl and let cool. Toss sliced apples, 2 tbsp. sugar, and 1 tbsp. flour in a bowl. Coat bottom and sides of spring-form pan with toasted graham cracker crumbs. Arrange apples in pan. 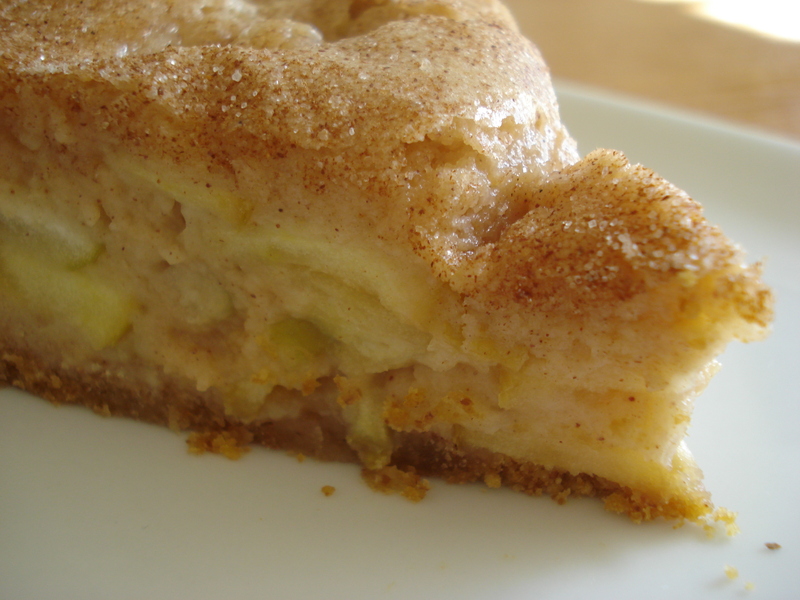 Combine 1 cup sugar, remaining flour, apple pie spice, baking powder, and salt in a bowl. Whisk in eggs, sour cream, and melted butter until smooth. Pour batter evenly over apples. Sprinkle remaining sugar (mixed with a bit of cinnamon for cinnamon sugar – if desired) evenly over batter and bake until deep golden brown and crisp, about 70 to 80 minutes. Transfer to a wire rack and cool at least 1 hour or completely. Remove ring from pan, slice, and serve (preferably with ice cream). 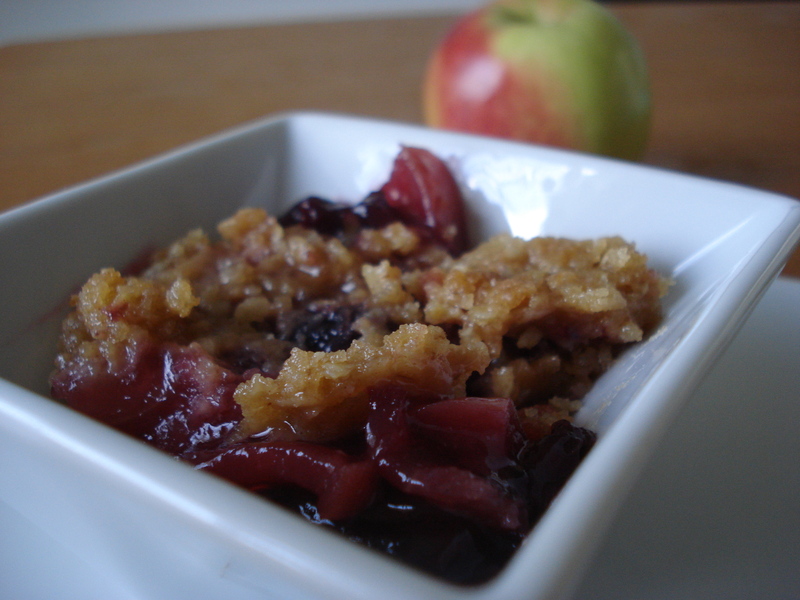 Cherries…Apples…Crisp… Some of my favorite words in the baking world and what’s not to love. 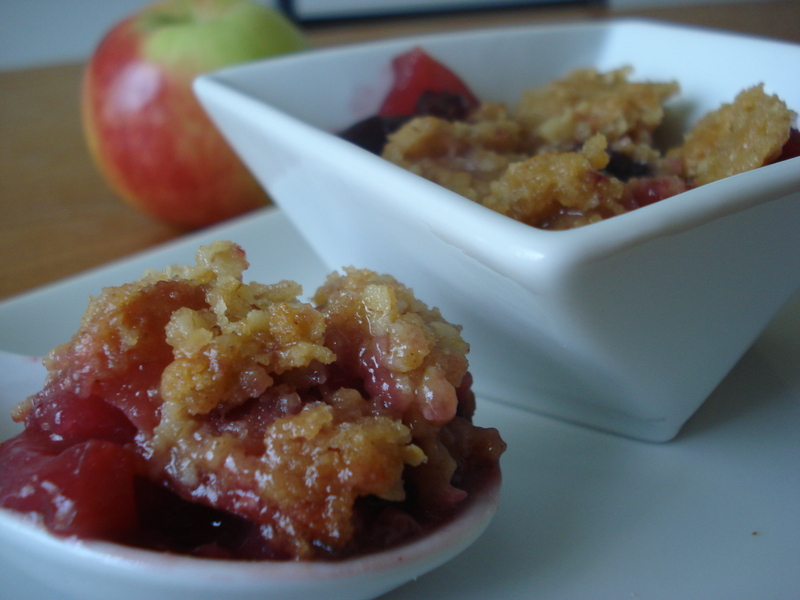 The crisp and sweetness of apples, the tartness of cherries and the crunch of the topping all combined into heartwarming goodness. 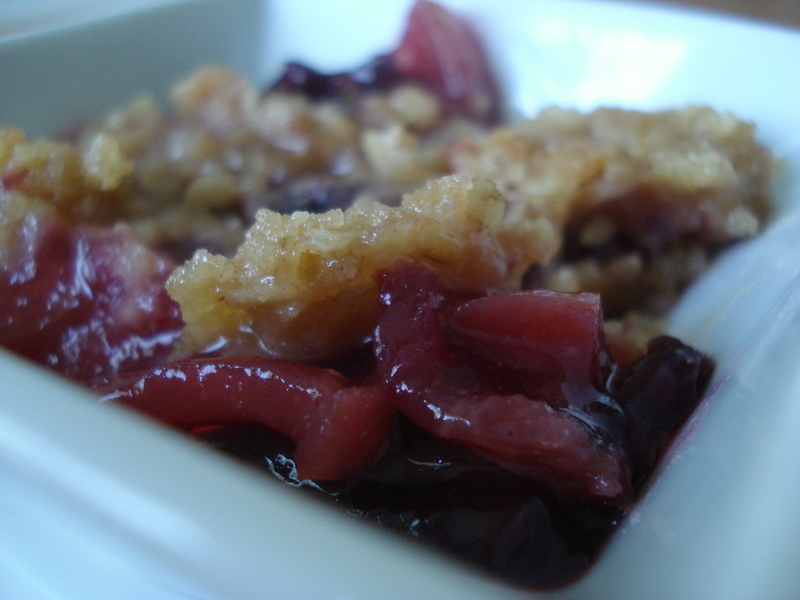 Something about traditional Apple Crisp speaks to me as a Fall/Winter baked good and cherries have always been irresistible to me since I was a kid, so I thought why not combine the two. It would create a great melody of flavors and rich colors for the eye. Little did I know, the flavors could be tart in one bite and too sweet in another and the crisp topping becomes soggy. Hmmm…how to fix such a culinary disaster. Clearly taking a traditional Apple Crisp formula wouldn’t be the trick. While contemplating how to go about things, it certainly didn’t help that my cats would not stay off the kitchen counter. Last thing you need is little kitty hairs in dessert. Not the way to end a meal lol. Once I gave them treats and sent them out of the kitchen it was back to the drawing board. The million dollar question of the day was how to achieve the right balance of flavors, with proper texture of the fruit and crisp topping. After coring, peeling, and chopping what felt like 30 pounds of apples I was ready to go. Did I mention how much I despise preparing apples for baking. I mean I really really really would love to find some alternate way to do such. That should be the focus of science research. I mean, we need apples in our diets which would be proper motive right… right. Well enough of my whining as most likely you all know exactly what I’m talking about having at some point experienced the pain of baking with apples so I don’t need to explain. Anyway…so I have my apples all chopped and ready and I did this so that once I get the cherries cooked down in some sugar and a little bit of water, they will be ready to be thrown in the pot. By cooking the apples for a few minutes with the cherries, it allows their excess juice to excrete, which prevents a runny mess later, allows the flavors of the cherries and apples to meld more uniformly, promotes a more even bake and last but certainly not least, a shorter cooking time. Amazing how such a simple step can save so much time and make all the difference in a product, but it certainly does. With that said be sure not to skip that step in the formula below. As the apples and cherries cook down, be sure to mix well so you get an even distribution of the red color. Not only is it your natural food color but also looks striking when plating. Adjust oven rack to the middle position and heat to 400°. In a food processor, pulse flour, sugars, cinnamon, and butter until mixture has the texture of coarse crumbs. Transfer to a bowl and stir in oats. Using fingers, pinch the topping mixture with your fingers to create peanut-sized clumps. Refrigerate topping while preparing the filling. Place the fresh or frozen cherries, ¾ cup sugar, and water in a dutch oven and heat over medium-high. Cook until the cherries are softened completely and mixture has reduced and thickened, about 10 minutes. 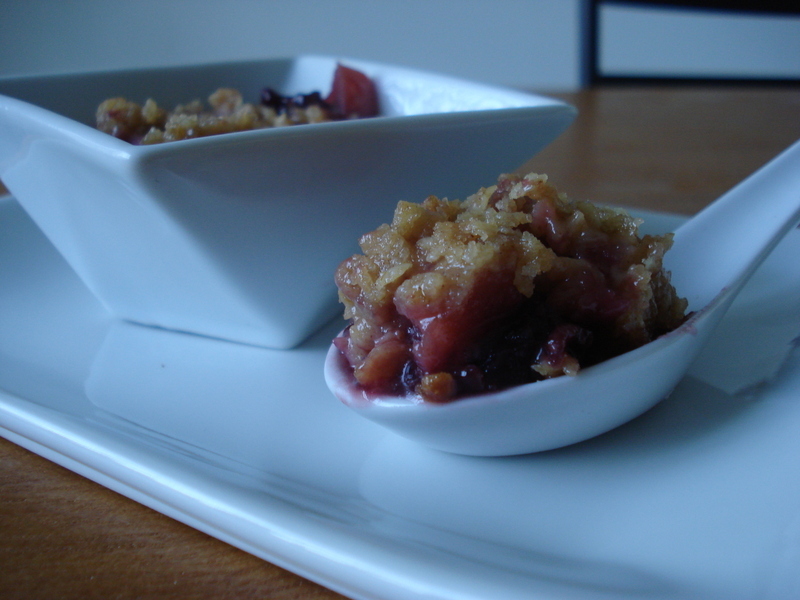 Scrape cherries into a bowl and set aside. Place apples, remaining ½ cup sugar, and dried cherries into the dutch oven and cook over medium-high heat until the apples begin to release their juices, about 5 minutes. Off heat, add the cooked cherries back into the dutch oven along with the tapioca. Mix thoroughly then pour filling into a 13×9 in. baking dish. Smooth the filling’s surface evenly with a spatula. Remove topping from the refrigerator. Scatter topping evenly over filling and bake until juices are bubbling and topping is deep golden brown in color, about 30 minutes. Remove from oven and place on a rack to cool. Serve while still warm. In most areas of the country, the leaves have fallen, temperatures feel closer to winter, and most importantly, the orchards have been cleared of their fruit before the frost and measurable snow sweeps in. Perhaps the two most significant fruits which remind me of fall are the apple and orange. Having already covered oranges in my previous post, I move on to apples. Since it is the holidays and time is certainly limited for all, finding a formula which is quick and simple to make is dire. 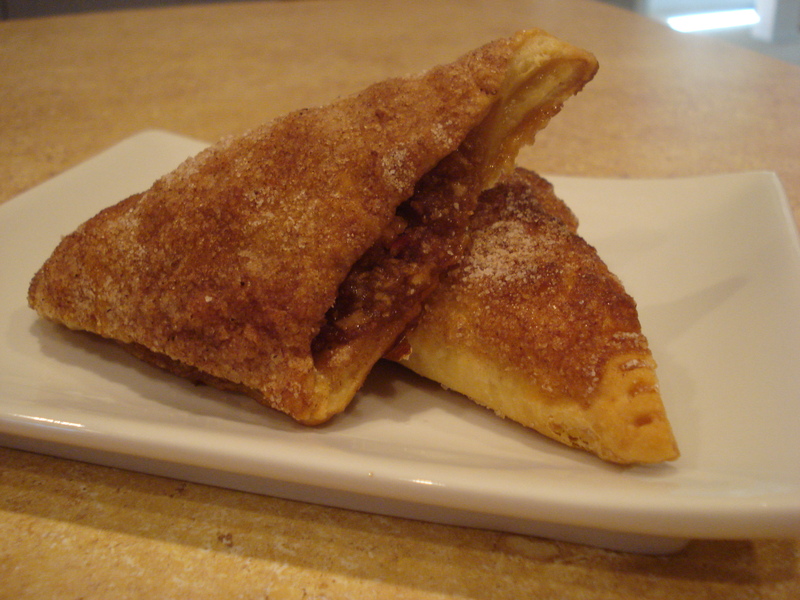 These apple turnovers are sure to please with their comforting sweetness, warming spice, and short preparation time. Although I enjoy the better flavor and texture of homemade puff pastry, who honestly has the time or patience these days to do such a laborous task. Certainly not I!!! For those never have attempted making homemade puff pastry, I will give you a word of wisdom. For the average home baker, the frozen stuff is just as good 😉 I say this because I have personally done the homemade version of puff pastry in my Bread’s class at Le Cordon Bleu, and I know what goes into this process. Believe me, it is not fun. Of course once those turnovers come out of the oven they certainly are worthwhile having known the process it took to get to that point but then you forgo your waistline as you feel compelled to eat every last one of those suckers knowing you worked so hard at them. Up you go 10 pounds like that. I will describe the process of making homemade puff pastry so those who have no idea what I’m talking about can get a better understanding of its complexity. First step of the process is to mix up your dough. Next it is rolled thin and into a large rectangle then spread with heaping amounts of butter. *Another quick word of wisdom…if you make this homemade you will never want to eat a turnover again because the amounts of butter which go into puff pastry can be nauseating. Continuing on with the process, the dough is folded over itself to cover the dough. This is called the puff pastries first turn. There need to be at least four turns in this process before you can move on to cutting the shapes for turnovers and after each turn the dough must rest in the refrigerator for about 20 minutes. It is a time consuming and especially aggravating process when your dough decides to tear on the last turn exposing your butter pack in the center as did mine in class. That is why I choose use the trusty and reliable frozen puff pastry from Pepperidge Farm for this formula. So with all of that said, we will begin this formula by thawing our frozen puff pastry sheets. Besides, even the greatest pastry chefs take shortcuts sometimes. It’s nonsense to believe they don’t. Bakery profits can double with little tricks such as these. Another trick of this formula is making use of all the apple has to offer. Not only will I use the apple for the filling, but also the juice it excretes. Less waste = more profits for businesses and the better the home cook feels about baking at home more often. It is important when buying apples to select a variety which can hold up to the harsh heat without turning to mush. The best choice for this formula is Granny Smith Apples. This variety is firm enough to hold it’s shape and also provides a tartness which compliments the sweetness added later. Now that we have the correct apple variety, let’s make sure it’s prepared properly. If left sliced, the apple would not cook all the way through before the puff pastry would essentially burn. Well unless the apple is sliced extremely thin but who has the patience or fingers to spare??? I certainly don’t and refuse to subject my stubby yet precious fingers to knicks with each knife slice trying to achieve such a silly feat. So instead the food processor is yet again a trusty reliable friend. With a few pulses, the apples come out a rough small dice. The perfect size for filling to give that slight crispness we love about apples but also making sure they soften in the short cooking time. Once the apples are chopped, it is important to strain them for a few minutes. This rids the filling of excess juice which would make the filling runny and the puff pastry soggy. Both no good. And don’t throw out that excess juice. We will need it later. Make use of anything and everything. Remember the pastry chef can make or break a restaurant. Same applies to a household. Can make or break you. If it breaks you to bake at home you wouldn’t be able to do it anymore. So conserve and get creative. That juice will be our glue to hold the turnovers together and be a low-fat alternative to spread on the top for color, flavor and again glue for the sugar and spice topping as opposed to the typical choice of butter/margarine. 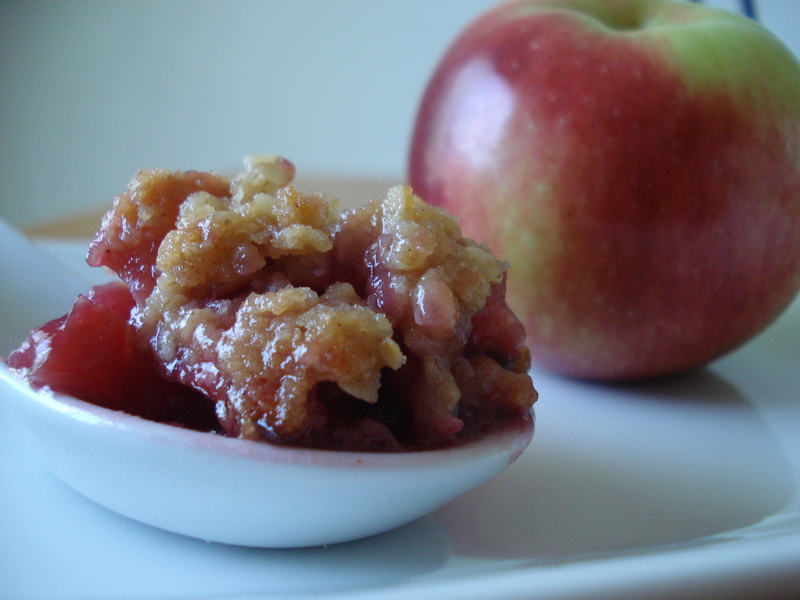 Now apples alone wasn’t going to cut it for the sole component of the filling, especially in their smaller state. The ultimate staple I use for toast came in handy for this formula. 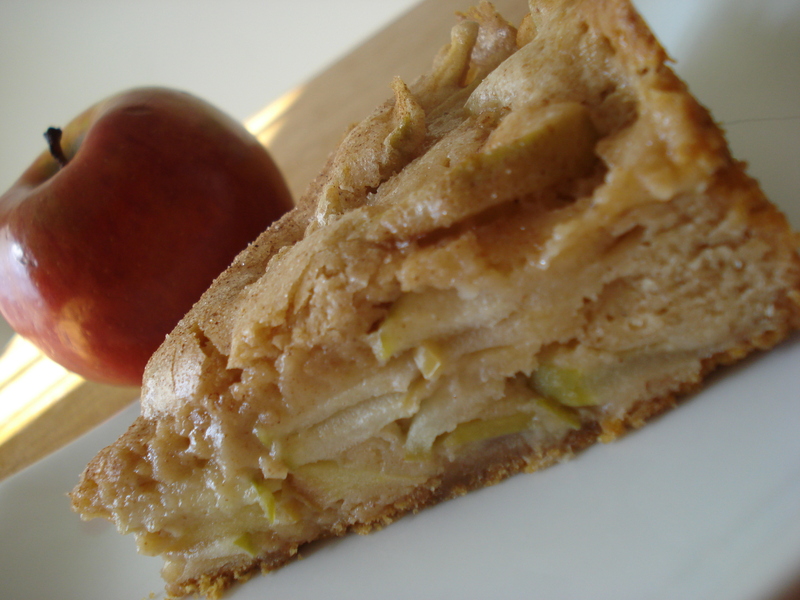 It gives the apples a much desired flavor boost and brings all the pieces together into a thick and delightful filling. What is this secret ingredient you ask??? Why Apple butter of course. But as always if you don’t have apple butter on hand as I do or it’s difficult to find at your local grocer, you can certainly use applesauce as a suitable substitute. If using applesauce I prefer the spiced variety over plain. It will usually state on the box somewhere that it contains cinnamon. Musselmanns being my preferred brand although any will give great results. *A few quick notes before I present the formula: If you don’t have a food processor, don’t result to slicing the apples or chopping them by hand. Run them across the coarse side of a grater. The recipe can easily be doubled or cut in half for your desired amount. If you need to make these ahead of time, go ahead and follow the formula as directed, filling the puff pastry, folding them over and freezing them on a baking sheet. Once completely frozen you can transfer them to a more space friendly airtight container or freezer bag. They can be stored up to 1 month. When ready to bake, thaw the turnovers at room temperature for about 20 minutes then proceed with the formula. Adjust oven rack to upper-middle & lower-middle positions. Heat oven to 400°. In a small bowl, combine 1/4 cup sugar with cinnamon, ginger, nutmeg, and cloves. Pulse the apples, remaining sugar, lemon juice, and salt in food processor until roughly chopped. Set a fine mesh sieve/strainer over a small bowl. Place apple mixture in sieve. Allow the apple mixture to rest/strain for 5 minutes in sieve. Reserve juice. Transfer apple mixture to a bowl and stir in apple butter. Unfold 1 sheet of puff pastry onto a lightly floured surface. Roll dough into a 10 in. square. Cut the dough into four 5-inch squares. 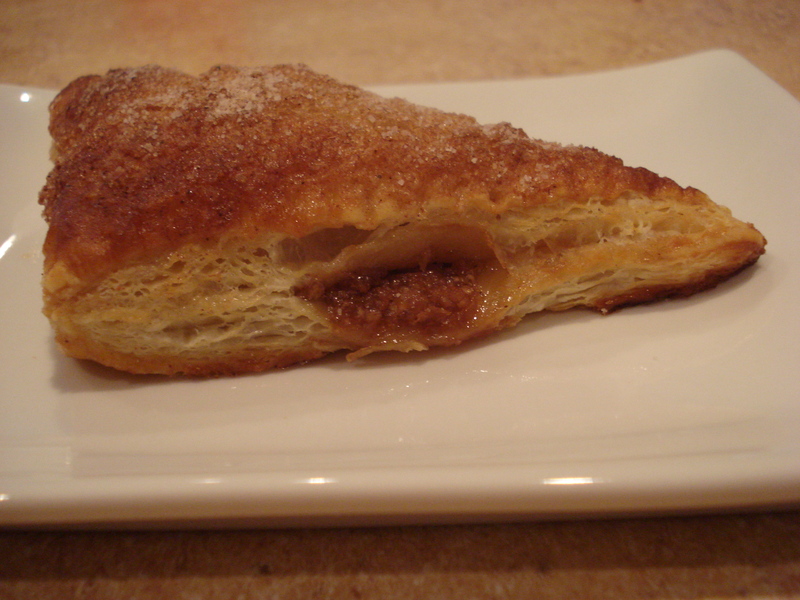 Fill each turnover with strained apple mixture. Brush the edges of each turnover with the reserved apple juice, then fold and crimp edges with a fork to seal. 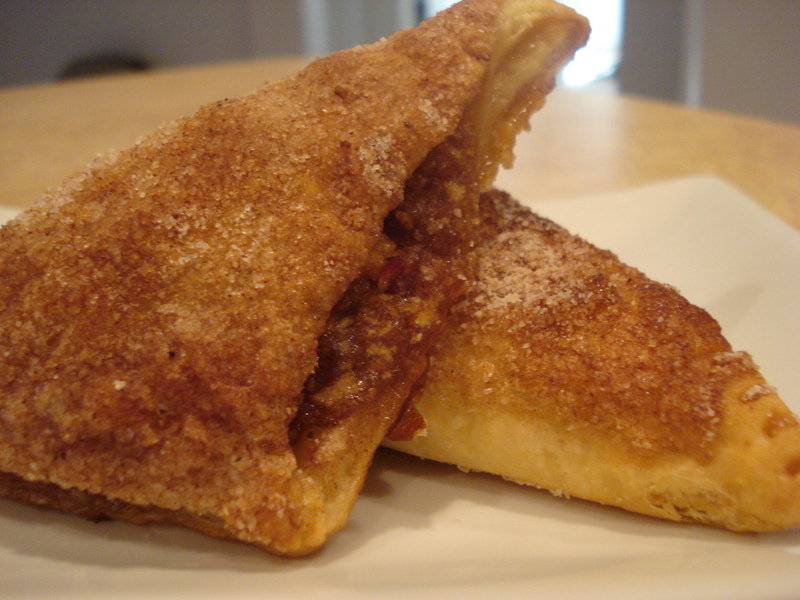 Place turnovers on a plate and freeze until firm, about 15 minutes. Repeat with remaining sheet of puff pastry and apple filling. Line two sheet pans with parchment paper. Before transferring turnovers from the plate, brush the tops with reserved apple juice and sprinkle with cinnamon spiced sugar. Place turnovers on sheet pan and bake until evenly browned, 20 to 25 minutes. Be sure to rotate the pans halfway through the baking time to prevent oven hotspots and promote even baking. Transfer finished turnovers to a cooling rack and allow to cool slightly. Turnovers are best served warm but can be eaten at room temperature as well.